Do you know a cancer patient who'd like a hat? There's all sorts of ways in which you can help them. Check out the list below and choose the one to support. When I lost my hair to chemotherapy my scalp was tender, inflamed and marked with outbreaks so it was important for me to keep it covered. My oncologist's office referred me to the cancer center's care center, where a lovely woman treated me like a precious jewel. She told me about their resources and asked about my lifestyle before she selected several hat styles, from out of sight. She is the one who taught me to wear a scarf under a brimmed hat. The scarf, a soft one that's comfortable to the touch, anchors the hat, if the fit is right, so the hat stays put even without hair. Her examples sparked my imagination, and before long I was able to combine my new hats and scarves for the looks I wanted, and the shade I needed, during the summer of my treatment. Organizations below offer either hats or patterns for making hats. Join a group of crafters and organize them to make or buy a batch of hats from the selections below, for your favorite cancer care center. The drawing is a detail from my Chemo Journal Drawings, and is copyrighted. No use permitted, but you can buy it on all those typical things at WhipCancer Please click on "It'll Grow Back." This whimsical hat will cover a child's bald head and make the tot laugh too. Bev's Country Cottage has an easy crochet project for children, for donations to a childrens' hospital, a cancer center, a homeless shelter, or a neighbor family. Size directions are for little kids. If you are a regular crocheter you can easily turn this out in an afternoon or a day. This is a good teaching tool because it shows you how to hold the hook and how to hold the yarn. There's nothing like pictures to show the story. Do You Knit or Crochet or Sew? Yes; I sure do crochet! Yes; I sew up a storm! No; I don't do any of the above; but I donate hats! Yes; I sew; crochet and knit too! Yes; I sew and crochet! Yes, I sew and knit. Knots of Love/ You Can Help Here! Fill out the Knots of Love Donation Form and set another hat on another child's head! A Kid Always Feels Better in a Hat! Hats Off For Cancer supports child cancer patients with hair loss, to ease their experience of this tough disease. I can't think of a better way to get your favorite Young Cancer Patient outdoors (protection from a sunburned scalp, or warmth in the winter). I had cancer-caused hair loss, and I'm not a kid, but I can imagine what these guys feel like without their hair, and how better they feel in hats. 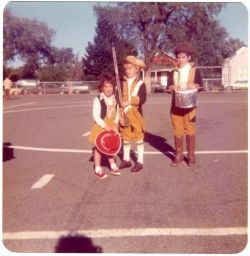 OK, those were my kids in 1976, and the hats make all the difference, wouldn't you say? Ryzellon uploaded this fancy headgear photograph and pattern at instructables.com. Ryzellon made the steps basic and simple. This young girl comes from a family where philanthropy is a part of their heritage. What an inspiration! Make these quick dishcloths as you learn to knit in a jiffy. Then move on to a beanie. 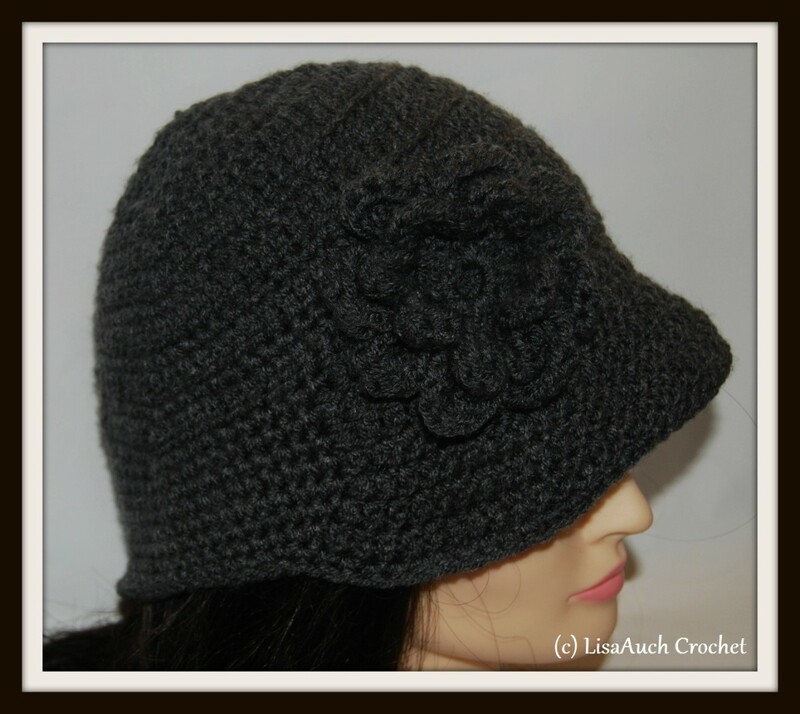 Learn to make cool hats from these links to headcovering patterns. In return, simply make an extra cap and donate one to charity. Then forward these links to your friends. Knit or Crochet Chemotherapy hats, chemo caps, Donate your hats to cancer patients. A wonderful loving touch that will make you feel good, and the cancer patient will remember your work each time s/he dons the special hat. Chemotherapy hats - How to knit chemo hats for cancer patients undergoing chemotheraphy treatment. 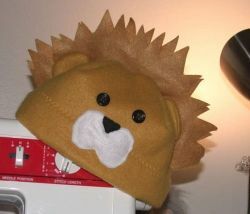 Find chemotherapy hat patterns, chemo cap tags, and mail-in instructions for Head Huggers. Please contact Ginny Hibbard Please mention "Chuck's Hats For Chemo" in the subject line. Breast Friends, in Florida, Mississippi and Oregon, understands the importance of a healthy attitude as it relates to healing, with a free pink or turquoise hat designed by the Hat Project designer to perk up a bald (cancer patient) woman's day. Some cancer patients lose every bit of hair all over their heads, even eyelashes, and others keep a scattering of hair that continues to grow, leaving them looking especially vulnerable. ChemoCaps is comprised of a group of knitters who make hand-knit caps for cancer patients. You can join the group and help those who really need a healing touch, a gift of a hat. It was started in honor of a young woman cancer patient who lived from 1975 - 2000, by her mother. Countless cancer patients have been the recipients of these gifts. Please organize a ChemoCaps.com chemocaps group in your neighborhood, and enjoy companionship and the knowledge that you are bringing happiness to special people who may feel vulnerable due to their hair loss. Find patterns on the website, donated by FiberTrends.com. Print and share the patterns with a group of knitters. ChemoCaps encourages school groups, scouts and other young people's groups to undertake this project. 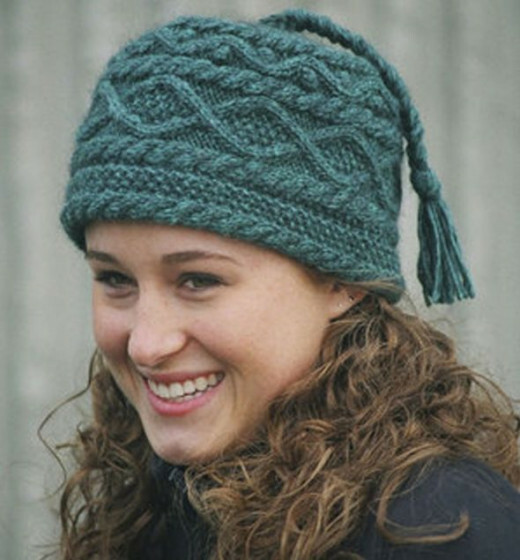 The hat shown is from a pattern you can purchase at buy your pattern for $5.95. Turbans look both exotic and glamorous, with vestiges of the '40s, when they are all dressed up. Yet they can be made of humble fabrics and be the perfect bedtime accessory during chemo or just during winter. Turbans made from this pattern and directions can be whipped up in no time. My suggestion is to plan a turban-crafting party with a group of friends, followed by/preceded by a potluck lunch. Ask each partygoer to bring a piece of fleece, with trim, in her/his color of choice. Be sure to have large needles and colored threads available for adding the trim. And look through your broken and unused jewelry to see if you have anything suitable to make a statement at the front of the turban. If you have a BeDazzle tool with studs and jewels, this could be a fine opportunity for using it to secure sparkly trim. These undercaps have deep crowns that come down to the eyebrows. Pop on an undercap and wear a brimmed straw or fabric hat over it! Presto! 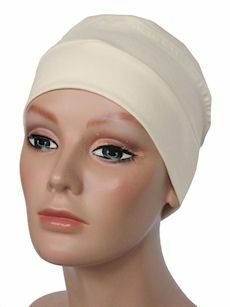 you've created a stylish and secure head covering that does not draw attention to your condition of chemotherapy or alopecia or other cause of hair loss. The caps can also be worn alone, or with a scarf folded and tied on at one side. Use a large scarf for a dramatic wrap. 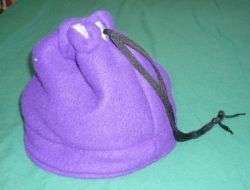 A No-Sew Fleece Hat - how Nifty! MommyDani2 demonstrates how to make this cap. She is a crafter, not a seamstress. She doesn't even sew! She uses a product called Liquid Stitch. She washes these hats in the washer and the hems hold up. She feels comfortable knowing that if a bit of hem should open up through use or washing, she can always apply a dab of glue to close it up again, in the future. Enjoy learning from this crafty mom, while her toddler walks across her project, and she continues without a blink! This makes an adorable, fun style hat. Bold and beautiful hats add a spark of confidence for a cancer patient. Fabric or knit hats and caps feel best on a tender scalp, and stay in place - no fear of the wind blowing it off and exposing the head. Straw hats can still feel comfortable when lined. Some lightweight woven fabric or straw hats can be secured to an undercap, or soft scarf by a long large-headed pin. Try assembling a dozen or two dozen hats in various styles, and deliver them to a cancer support group, along with a selection of soft scarves and undercaps. A Parkhurst brimmed cotton sunhat is what I wore during chemo. I loved it and so did everyone who saw it. I wore it for a couple years, until I left it at a friend's house one day on a trip. Time to get another one. This is a great article. The funny thing is I just wrote a lens on making crafts in your spare time and donating them to charity. weird eh. These are great. I was just researching a charity to help out. It donates cowboy hats to kids with cancer. @Susan Zutautas: Best to you. It's really rewarding to know your every stitch counts, isn't it. Thanks. In January I plan to start making hats for the hospital that I'm currently going to for chemo and radiation treatments. Love your projects.! @DeborahDian: Such generous people have developed ideas for others to do good too. These are such wonderful projects! @GrimRascal: Are you ready to try your hand at knitting or crocheting, like Roosevelt Grier does? He's quite a character, with his bulk and yet his tender skills in needlework. Really nice lens, thank you for writing it. It is very inspirational and the hats are great! 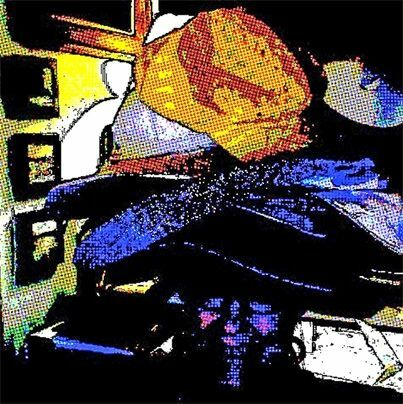 @smine27: Thanks smine27, it looks like you're a hat person too. Some of these hats would make a great gift for just about anyone. @richardrose: Thank you. Since I was a new Muslim at the time I was curious to discover what styles of headcoverings I could uncover that would be dual purpose. A tender scalp needs special care. @shellys-space: Thanks so much, and I hope your MIL gets lots of green nutrition to support her new hair growth. It's such a trying time. Those chemicals wreak havoc on the body. I am thankful my MIL didn't loose all her hair. Her hair is already very thin and she has been taking some medicine for cancer, but didn't have to go through a complete chemo program after she had both breasts removed. You have made a very inspiring page, thanks for sharing! @DebW07: DebW07, how true. thanks for commenting. Wonderful lens, very inspirational! Giving to others is our greatest reward to ourselves. Your lens is an inspiration. Love the variety of hats. What a wonderful idea!!!!!! Also I LOVE some of the amazing hats, caps, turbans etc you have here! So cute! This could help so many people. Blessed! What a wonderful idea and project. Thanks for the information! I'm glad to see where I can donate hats; I work on afghans mostly, but I always have extra yarn and this looks like a fabulous way to use it up and be a blessing to someone else at the same time. I love your lens itâs very inspiring, it's also really helpful. Thanks for sharing. The hats are just a great gift. Thanks for the idea. Such a thoughtful lense. Really enjoyed. I sure know the need for a hat as I had been with friends who had cancer. Good of you to highlight this. I absolutely love these hats and what they mean for those who have an intimate relationship with cancer. Though my mother is in treatment for cancer (thyroid now and breast cancer previously), it seems amazing that she has never lost her hair. What a beautiful way to express TLC for anyone who must deal with cancer and its effects. Blessings to you. Angel Blessings** Wonderful charity idea. @pawpaw911: Condolences on your loss. I know it's heavy. I appreciate that you found your way here, to express yourself. Thank you. Very important work. Thanks for doing this page on Cancer hats. We lost a family member to breast cancer Sunday. She made good use of some donated hats. Thanks for your comments and concern. 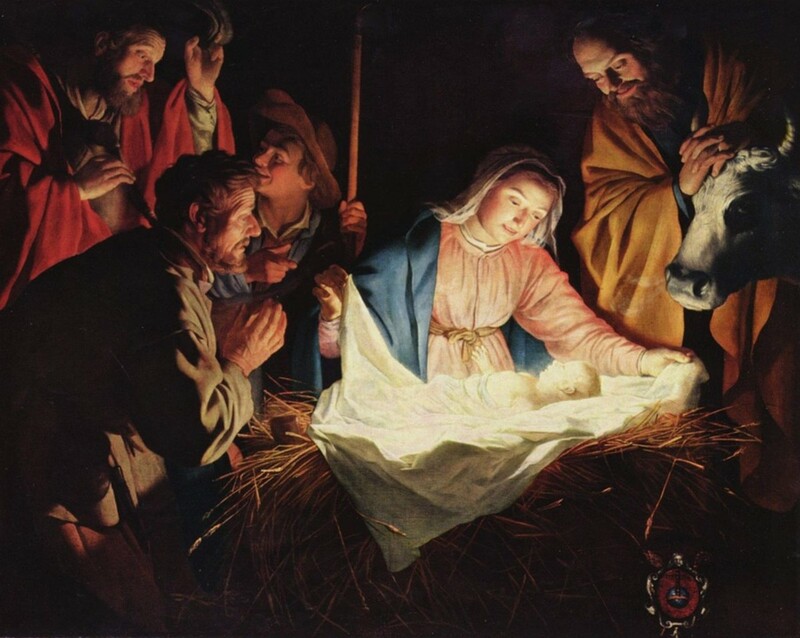 Turns out it is another type of item of unknown origin, that bears watching, but not cancerous, praise God. Nice lens here...I hope things are going ok for you. I notice you have another cancer scare. Today I face another cancer scare, since there's a sizeable what mass on my spine. Prayers appreciated. 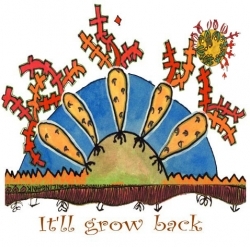 @Ladyeaglefeather: It's always interesting to learn how others paved the paths before I even knew about the needs. @Gypzeerose: Yes, I feel much of my chemo pain every time I think of it too, and that's the motivator to help others. Bless the people who put together the ideas. @Ladyeaglefeather: Isn't it lovely how so many people have taken hair-loss into account in their hat and pattern designs! @anonymous: Knowing first-hand how I felt when I received hats, during chemo, it was a pleasure to put this lens together. @anonymous: Encouragement is its own reward. Thanks for spending time here. @anonymous: Thanks to the wonderful people who created the patterns, and to folks like you, more cancer patients will have gifts of hats. This lens brought bad memories for me, as I thought of my own cancer and chemotherapy. Nonetheless, it saved my life! You put a lot of work into this lens and it will help a lot of people: Angel Blessed! after the chemo, kids would need something to cover their heads. can't expect them to wear turbans so hats are much better. angel blessings for this charitable cause. wow, you do some much to help. Thank-you for this lens. I didn't know, about this. @blue22d: It's wonderful to be one small link in a huge chain. 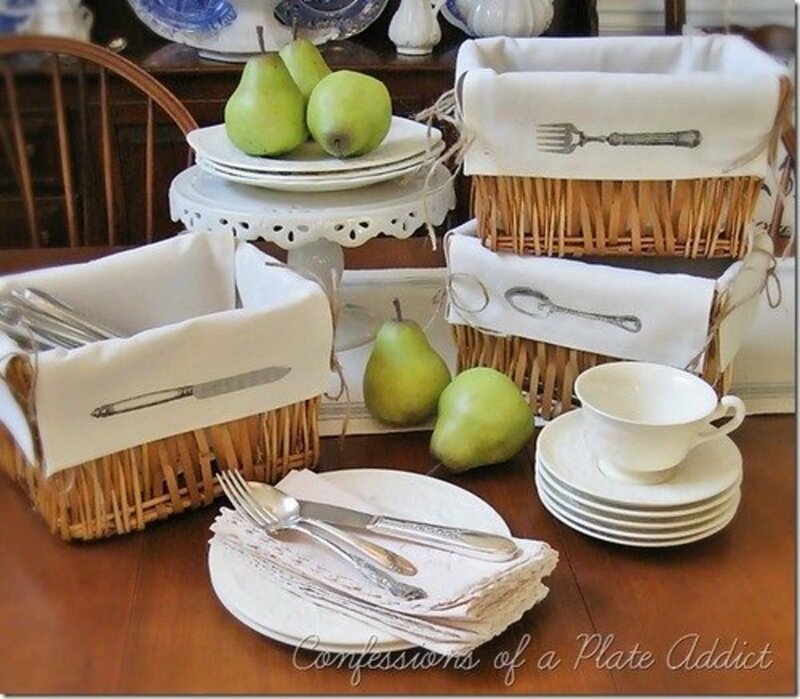 When someone shares a crafty pattern, they really start the chain. @sousababy: Yes, those knitters are really grand. 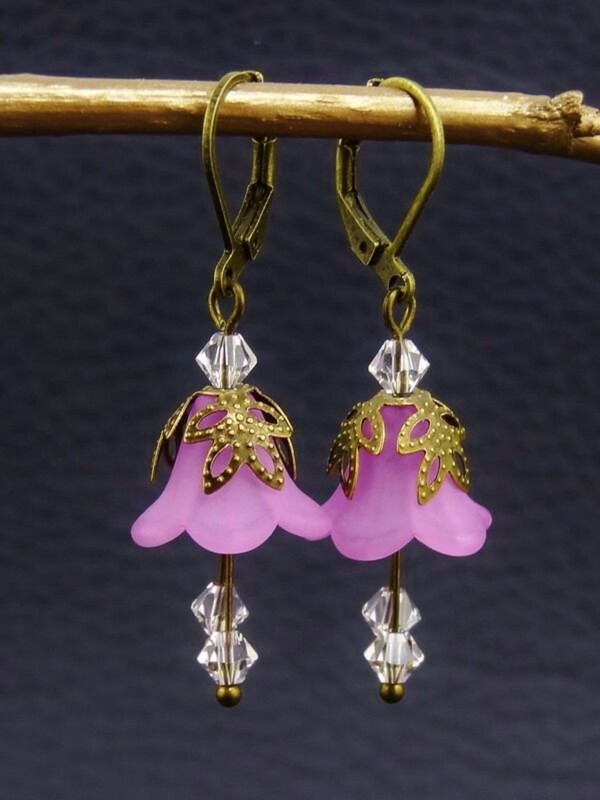 For some, it's a full-time retirement vocation, and what would the wearers do without them! @julieannbrady: Thanks. I've subsequently found this same hat pattern at many websites, so I can tell it's popular. @sarahrk lm: Bless you, Auntie! He will remember your loving act long after chemo ends, each time he puts on a hat. @Monika Weise: Four is a huge number of cancer survivors in one family. They are blessed to have your care. @sarahrk lm: Way to go, Auntie! He'll remember that loving act long after his chemo ends! great work your doing here, enjoyed seeing how you help others. What a wonderful opportunity to serve those who are experiencing cancer and such an excellent presentation of resources. I love how the hats are so varied for age and for personality and style....blessed! Oh the hats for the children, how wonderful. I can do that! I can crochet them. Bless you Papier. Your lens will help others. 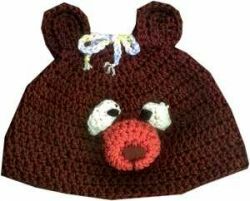 I have always had the utmost respect and admiration for those who knit caps for babies at the hospitals where I have worked. This is such a fabulous resource. I am not a knitter but I really love to purchase these for others. Thank you so much for sharing. Ah, I sure do love what you have presented ... very inspirational ... very cute too: Crochet Bev's Bear Beanie !! I recently knitted about a dozen hats for my 18 year old nephew who was being treated for cancer. It felt good to do it and he would choose the colors. @Monika Weise: thanks Monika, and everyone for your responses. I can't imagine having four family members who have had cancer, but it really makes the rise in cancer cases very personal. Thank you so much for doing this lens. Four of my family members have had cancer and I really appreciate this lens. Thanks, this was a helpful site. Many good ideas!